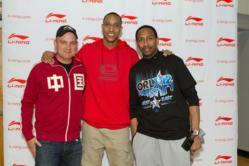 Pictured from left to right: Mike O'Malley, Evan Turner, Stephen A. Smith. Li-Ning , a leading sneaker and athletic apparel company founded by Chinese Olympic medal-winning gymnast Li Ning, hosted its second annual All-Star Weekend pick-up basketball game for top sports journalists on last Sunday. As a way to provide a new twist to the weekend, Li-Ning brought together basketball journalists, bloggers and shoe fanatics for an all-things-basketball event. Activities included a pick-up game with official referees, a three-point contest, as well as special celebrity appearances by Shameless writer and producer Mike O’Malley, Philadelphia 76ers guard Evan Turner and renowned sports analyst Stephen A. Smith. Li-Ning also made a sizable donation to the venue hosting the event, Celebration High School in Celebration, Fl. The game provided commentators with the opportunity to experience Li-Ning’s brand philosophy as well as its new products. Members of the media were divided into two teams – Yi and Kuang – which stand for the Eastern ideals of natural internal forces, a belief that Li-Ning infuses into their corporate culture and products. The special edition Li-Ning Year the Dragon Turnpoints that Evan Turner wore during the Rising Star Challenge (coached by Charles Barkley and Shaquille O’Neal) on Friday night were also on display at the Media Run on Sunday. To add to their already robust basketball line, Li-Ning will present various special edition sneakers and expand on their women’s fitness and running line in the coming months. For more information on current products, please visit http://shop.li-ning.com/. Digital Li-Ning is a joint venture between Acquity Group, a leading Brand eCommerce and digital marketing company, and Li-Ning, a leading sportswear brand that inspires athletes—body, mind and spirit—and empowers them to stand apart from the ordinary. Digital Li-Ning was formed to introduce the Li-Ning brand to the U.S. market as part of Li-Ning's efforts in exploring overseas market expansion opportunities, and it is managed from Chicago. For more information, please visit http://www.li-ning.com.